Researchers have evaluated tools in several EU countries and are presenting the results at a conference. New measures against youth unemployment were examined by labor scientists from the Ruhr-Universität Bochum (RUB) together with international partners in the EU-funded project “Job Developer”. From 2015 to 2018, the project team developed a certification program that enables experienced professionals to train as consultants to help young people seeking employment on their way to self-employment. The project trained 55 Job Developers who helped 70 young people from Bulgaria, Hungary, Greece, Spain, and Lithuania to develop their own business ideas in the form of services or products, depending on the potential in each of the countries. So, over 100 new ideas where generated. The marketability of those where tested, for example with 20 ideas being put under scrutiny in the region of Grabovo, Bulgaria. “The most popular services there were in the field of electrical installation, herbal healing consultants and gardeners,” says Dr Martin Kröll, coordinator of the project. For each young person, a long-term personal development plan was developed during the course of the consultation. The Job Developers used three tools during the consultation process: the Talent Diagnosis, with which they worked out the individual strengths of the jobseekers; the Employment Radar, which analysed the potentials in the local employment environment; and the Expert Hearing, which brought the jobseekers into contact with established professionals who have a network in their respective industries. These concepts come from the organisation Minipreneuere; they where adapted to the cultural, legal and structural framework of the participating countries and then evaluated. The project resulted in a certification program in English and German, consisting of five self-study modules. The Job Developer training enables individuals to organise and conduct the Talent Diagnosis, Employment Radar, and Expert Hearing. The feasibility study showed that individual strengths of adolescents can be revealed with the Talent Diagnosis. The tool also promotes the self-confidence of jobseekers and provides a starting point for career counselling. However, the Job Developers noted that it was a challenge to use the tests to identify the skills that young people could still develop. Resistance could also exist if IT-based tests caused high acquisition costs and too many talent promotion concepts could no longer be reconciled. The Employment Radar was seen by study participants as a structured and creative methodology to make market development more transparent and to identify employment potential in a region. However, in the context of this measure, the adolescents reveal their business concepts to other participants and experts, and expressed concern about theft of ideas. Organisationally, the analysis of the market interviews was a particular challenge due to the volume of data. Above all, the participants saw the potential of Expert Hearings in the direct contact with the experts who inspired, motivated and encouraged the young people to reflect on their professional development. “This element helps to close the gap between the education system and the demands of the labour market,” concludes Martin Kröll. Problems arose in the practical implementation, for example because experts were rarely available or did not communicate with the jobseekers on equal footing. Thursday and Friday, 7th and 8th of December 2017, Job Developers have achieved their qualification at Heraklion. The next step is to mentor and support 34 unemployed youths. Discover local employment opportunities, create jobs and develop one’s own talents for new job opportunities: to contribute to the reduction of youth unemployment in Europe, work scientists from the Ruhr University Bochum want to follow this approach. Therefore they have joined forces with the SHS foundation/minipreneure gGmbH that was founded by Peter Hartz and experienced partner institutions in Europe. The aim of the project is to train Job Developers who subsequently act as multipliers and support adolescents and young people from Greece, Spain, Lithuania, Hungary and Bulgaria to conduct an analysis of requirements of the local labor markets. For instance, the young people look at the demand for services in their environment and assess with which offer they can address potential employers. The Job Developers also help the adolescents to become aware of their talents and interests and to find out which jobs they are especially well suited for. The respective talent diagnosis consists of different suitability diagnostic and co-creative procedures. The joint project “Job Developer: from job creation to competence development” is funded with approx. 450 000 Euro from the EU program Erasmus+ and managed by Dr. Martin Kröll, RUB-Institute for Work Science. The scientists cooperate with institutions from Greece, Spain, Lithuania, Hungary and Bulgaria. “We want to contribute to the discovery of new employment opportunities through a certified qualification program and the implementation of innovative concepts“, says Dr. Martin Kröll. The Job Developers receive a certificate that documents their new type of qualifications. The participating adolescents are supported in creating jobs and in developing new skills. The qualification Job Developer is targeted to be established in the individual EU countries as a recognised certification program. „We hope that the training of the multipliers leads to a profitable learning effect on all sides. Our aim is to establish structures in the participating countries that consolidate the implementation of the concepts“, says Martin Kröll. On the basis of gained experience within the course of the project, self-learning modules will be developed. In the evaluation of the project, the reviewers especially praised the cooperation and exchange of the international partners with regard to the local implementation and adjustment of the concepts. The partners in Greece are the management consultancy eniochos.CONSULTING and the Technology Park of Crete that belongs to FORTH, the biggest research center in Greece. 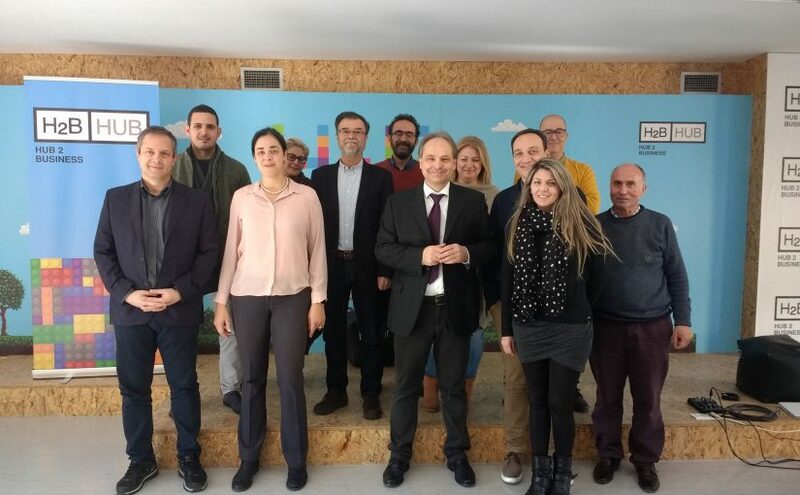 In Spain the European Centre of Enterprises and Innovation of Murcia (CEEIM) is participating in the project. In Hungary the Chambers of Industry and Commerce of Pécs and the Chambers of Industry and Commerce of Gabrovo in Bulgaria as well as the Lithuanian Chamber of Industry, Commerce and Crafts in Vilnius could be won for the project.